This page is produced from a book entitled Our People. Our People was prepared in association with the Aboriginal Consultative Group, Sydney, and other Aboriginal groups. A team of specialist advisers also assisted in the preparation of the text. 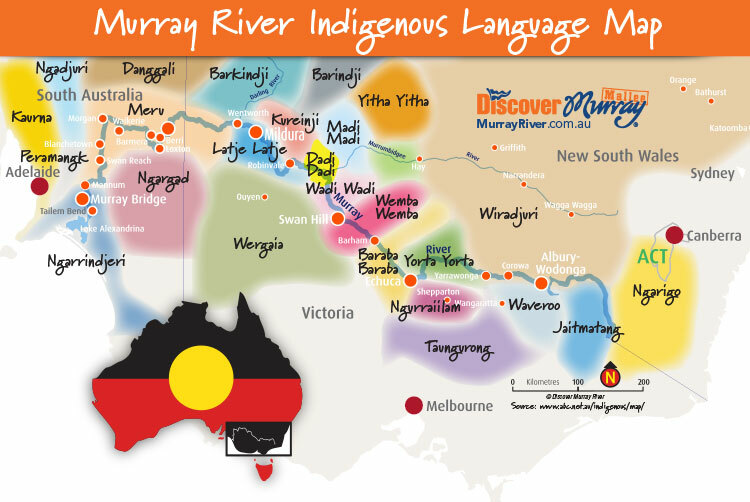 People of the Murray River traces the ways in which the Ngarrindjeri (South Australia's Murray River region), Yorta Yorta Nation (Echuca region) and other clans along the Murray River lived on its banks and the nearby flood plains for thousands of years right up to the present. Spoken in the words of a modern young Aborigine, Our People stresses the importance of a traditional heritage to today's Australians, both black and white. There are many of us Aboriginies along the Murray River today. We have been here for thousands of years, long before the white people came. This is the story of what life was like then and how it is for us today. The Murray is one of Australia's longest rivers. Our people have been living here for thousands of years. We call the river Millewa or Tongala. It starts high up near Mt Kosciusko and winds through the saltbush and mallee plains of New South Wales and Victoria. When it reaches South Australia the river narrows and runs through high cliffs. At last it spreads itself out into Lake Alexandrina. The land and the river have always been very important to us. Near the river there were once many swamps and billabongs. These were flooded each spring when the melting of the winter snow in the Snowy Mountains filled the river. At this time of year the reeds grew more than two metres high. We had to burn paths through the reeds to reach the river bank. At flood time in the swampy country we lived on small islands. Our river is wide and always full of water. There was always plenty of food in the billabongs and on the land nearby. We did not need to move far to collect our food. Many tribes lived on the river, more than in most other places in Australia. One of the largest groups were the Bangerang who lived where Echuca is today. As the mouth of the river lived more than 3000 of the Ngarrindjeri people. Our people are famous for their canoes. We used them for fishing, setting our nets and crossing the flooded creeks. The canoe was made from a single sheet of red gum bark. Many trees used for making canoes can still be seen along the river bank today. In cold weather we made a small fire on a bed of clay and wet reeds inside the canoe. So the fish could be cooked and eaten as son as they were caught. Sometimes we wore small aprons made from stripes of wallaby or possum skin. We also wore necklaces of reeds and animal teeth and feathers in our hair. In cool weather we wore cloaks of possum skin fastened with a pointed piece of wood. First the skins were pegged out to dry. We removed the flesh by scraping the skin with a mussel shell and painted them with red ochre. Then we sewed them together with sinews from possum or kangaroo. The Ngarrindjeri women wore round mats of reeds as well as cloaks. They tied the cloaks and mats with twine so that baby could be carried in the pouch at the back. In fine weather they made windbreaks by placing boughs together in a semicircle. The Ngarrindjeri people made more solid huts using a framework of boughs covered with grass and reeds. Some of these huts were up to 5 metres long. We caught much of our food using nets and dams. The nets were for catching fish, animals and birds. We made them from the fibres of rushes that grew beside the creeks. The rushes were chewed and then twisted by rubbing them on the thigh. See if you can make twine this way. We also caught fish by making dams across the narrow creeks. First we pushed the stakes into the creek bed. Then we wove branches through the row of stakes. At flood time the fish swam into the shallow creeks and billabongs. As the flood waters went down, thousands of fish were trapped behind the dams. Women gathered all the plant food. They dug for bulrush roots and rushes and collected pigface berries. We ate bulrush roots with every meal, just as white people eat bread. In the river the women caught crayfish and yabbies and spent much of their time diving for mussels. They carried the food back to the camp in net bags and baskets. On Lake Alexandrina the women used rafts made form thick branches and reeds bound together. In this way they could reach the beds of mussels. Up to ten women could sit on the raft and pole it out from the shore. They cooked the mussels on the raft over a fire raised on wet seaweed and sand. Now and then they dived off in search of more mussels. Fish and shellfish were our main food. Men did the hunting with spears or nets as well as dams. Flocks of ducks, pelicans, black swans and other water birds were trapped in the nets that they strung across the creeks. They made stronger nets and staked them out between the trees. These were for catching emus and kangaroos. The cords of these nets were as thick as your finger. To hide from the animals they hunted, men made screens of branches woven with grass. They would creep u on the emus and kangaroos until they were close enough to speak them. The men also made rods to snare waterbirds. For camouflage they put branches of reeds on their heads and swam underwater through the reeds. They snared them around the neck one by one. Beside the river are great oven mounds made of clay. We did most of our cooking this way. The women dug a hole in the mound and set a fire in the oven hole to heat the lumps of clay. Then they swept out the fire and placed the animals and roots inside, wrapped in layers of damp grass. The hot clay lumps were placed on top and in a few hours the meal would be perfectly cooked. Have you ever tired to cook a meal this way? There was plenty to do in a camp. The children played at hunting and fishing with small models of the adults' tools. The men made all their tools and weapons, large nets, cloaks, bags and canoes. Women made the smaller nets and bags, baskets and mats. They also built the family hut. Men skinned and cut up the animals while women prepared the vegetables and fish and did the cooking. All our stories and music were passed on at the night corroborees. Children sat and watched and sometimes we joined in. The Ngarrindjeri people made up a song about the first steam train they saw. It went like this. It blows like a spouting whale. About 170 years ago the first white men travelled down the Murray looking for new land. Battles were fought and many of our people were shot. Some fell ill from white people's diseases. The cattle and sheep trod down the reeds and grasses. They drove away the birds and animals that used to feed there. We were offered no place in the white people's world and were driven from our homelands. The old way of life that lasted 40 000 years was quickly destroyed. About 100 years ago a mission was built at Point Macleay which we call Rawagung in the land of the Ngarrindjeri. The people tried to live in the old way and adapt to the white people's ways, too. Here they are wearing clothes and using tin mugs and billies. Why do you think they don't look happy? On the land of the Bangerang a government reserve was set up called Cumeroogunga. The survivors never left the river, but camped along the banks where they could. Today at Cumeroogunga the people run a co-operative farm. Some are still living and working at Port Macleay. All along the river, families are farming or picking fruit and vegetables in the orchards and market gardens. At Dareton near Mildura, the Coomealla Aboriginal Housing Company manages their own 25 hectare farm. They harvest more than 90 tonnes of dried currants and sultanas each year. Aboriginies from the Murray and from as far away as Bourke work here picking fruit at harvest time. Make models of the nets and dams the Murray people built. Use twine for the nets and twigs or paddle sticks for the dams. This is an activity for an excursion. See how well your group can make a windbreak. Before you start, decide which way the wind is blowing. Collect fallen branches and shape your windbreak in a semicircle using the larger pieces first. Weave small branches through the large ones. What other plants can you use for making tools or nets? This is the easiest way to cook a delicious meal! Scoop out a shallow pit in the earth and set your fire in it. Place stones on and around the fire. When the stones are hot rake out the fire and place wet, green leaves in the pit. Add potatoes, while fish or a chicken on the leaves. Add more green leaves, then the hot stones and cover with earth. Cooking time: 3-4 hours. Stay near the fire and put it out when your have finished.